Ear clearing or clearing the ears or equalization is any of various maneuvers to equalize the pressure in the middle ear with the outside pressure, by letting air enter along the Eustachian tubes, as this does not always happen automatically when the pressure in the middle ear is lower than the outside pressure. This need can arise in scuba diving, freediving/spearfishing, skydiving, fast descent in an aircraft, fast descent in a mine cage, and being put into pressure in a caisson or similar pressure-bearing structure, or sometimes even simply travelling at fast speeds in an automobile. People who do intense weight lifting, like squats, may experience sudden conductive hearing loss due to air pressure building up inside the ear. They are advised to engage in an ear clearing method to relieve pressure, or pain if any. The "Frenzel maneuver": Using the rear part of the tongue and throat muscles, close the nostrils, and close the back of the throat as if straining to lift a weight. Then make the sound of the letter "K." This pushes the back of the tongue upward, compressing air into the openings of the eustachian tubes. The "Toynbee maneuver": pinching the nose and swallowing. Swallowing pulls open the eustachian tubes while the movement of the tongue, with the nose closed, compresses air which passes through the tubes to the middle ear. The "Valsalva maneuver": pinching the nose and closing the mouth and trying to breathe out through the nose. If the hand cannot reach the nose, it is possible to learn to pinch the nose shut by the action of two small face muscles called compressor naris. This is the first technique normally taught, but needs to be performed gently to lessen side-effects. The "Lowry Technique". A combination of Valsalva and Toynbee: pinching the nose to close the nostrils, and blow and swallow at the same time. The nose can be closed without using a hand, using the compressor naris muscles; it can be described as "wrinkling the nose as if there was a bad smell". A hand cannot be got to the nose if using a full facemask. Many eyes-and-nose diving masks have two small pockets in their underside, or are like goggles with the soft edge extended downwards over the nose, to let two fingers reach the nose and pinch it. The "Edmonds Technique". While tensing the soft palate (the soft tissue at the back of the roof of the mouth) and throat muscles and pushing the jaw forward and down, do a Valsalva maneuver. Voluntary opening of the eustachian tubes – French: béance tubaire volontaire (BTV) – is a method of equalising or clearing the ears described by doctor Georges Delonca and used in scuba diving and freediving. It aims to rebalance the pressure between the external ear and middle ear. The subject must either exercise a voluntary control of the tensor veli palatini muscles opening the eustachian tubes, or move the jaw to open the tubes when necessary. Another description of the method is to tense the muscles of the soft palate and the throat while pushing the jaw forward and down as if starting to yawn. This should pull the eustachian tubes open. 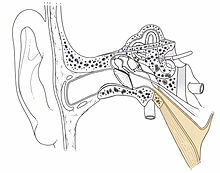 This is less easy to execute than the Valsalva maneuver, but the BTV is the gentlest method to clear the ears. However, not all divers can perform this maneuver. It may be necessary to engage in ear training exercises to train the muscles to perform this maneuver. *: Some people are able to voluntarily hold their Eustachian tubes open continuously for a period of several seconds to minutes. The 'clicking your ears' can actually be heard if one puts one's ear to another person's ear for them to hear the clicking sound. Those that are borderline on learning this voluntary control first discover this via yawning or swallowing or other means; which after practice can be done deliberately without force even when there are no pressure issues involved. When the Eustachian Tubes are deliberately held open, one's voice sounds louder in one's head than when they are closed. No single method is considered safest or most successful in equalization of the middle ear pressure. Using alternative techniques may improve the success individually when a technique fails. The pressure difference between the middle ear and the outside, if not released, can result in a burst eardrum. This damages hearing, and if this occurs underwater, cold water in the middle ear chills the inner ear, causing vertigo. The pressure difference can also cause damage to other body air spaces, such as the paranasal sinuses. This can also be caused by damaged sinus ducts. To allow successful equalization when diving, it is important that the diving suit hood does not make an airtight seal over the outside ear hole, and that earplugs are not worn. It is not recommended to dive when a eustachian tube is congested or blocked, e.g. with the common cold, as this may cause what is known as a reverse block. Descent is uninhibited as the Valsalva maneuver may still clear the eustachian tubes temporarily by force, but during ascent a blockage may stop the air in the middle ear (which is now at depth pressure) from escaping as the diver ascends. The eardrum then bursts outwards, causing the same hazards as with an ordinary burst eardrum, such as cold water in the middle ear deranging the working of the sense organs of balance in the inner ear. Nasal congestion may affect the sinus openings and the eustachian tubes and may lead to difficulty or inability to clear the ears. To prevent congestion, allergies can be treated by the use of antihistamines, decongestants and nasal sprays, and allergy desensitization. Recently developed antihistamines do not cross the blood-brain barrier and do not produce drowsiness, but may only be available by prescription. Decongestants can have side effects such as speeding up heart rate which may have adverse effects in cases where there is underlying cardiovascular disease. Over-the-counter nasal sprays can produce a rebound effect causing greater congestion when the effect wears off, which can lead to reversed ear blockage on ascent. Some steroid nasal sprays do not have this side effect and can be very effective, but may also only be available by prescription. Combinations of the same drugs are useful in non-allergic rhinitis. These medications can be very useful in controlling the nasal congestion problem. 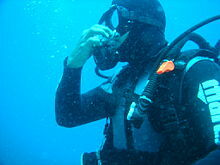 Divers get training in clearing the ears before being allowed to dive. Because of the potential for side effects of the valsalva maneuver, scuba divers and free-divers may train to exercise the muscles that open the Eustachian tubes in a gentler manner. The French underwater association (Fédération Française d'Études et de Sports Sous-Marins) has produced a series of exercises using the tongue and soft palate to assist a diver in clearing their ears by these techniques. These recommendations were based on work done at the Médecine du sport, Bd st Marcel, Paris. With practice it is possible to close the nostrils hands-free by contracting the compressor naris muscles. ^ Molvaer, Otto I (2003). "8: Otorhinolaryngological aspects of diving". In Brubakk, Alf O; Neuman, Tom S (eds.). Bennett and Elliott's physiology and medicine of diving, 5th Revised edition. United States: Saunders Ltd. pp. 231–7. ISBN 0-7020-2571-2. OCLC 51607923. ^ a b c d e f g h i j k Kay, E. "Prevention of middle ear barotrauma". Retrieved 2008-05-01. ^ Kay, E. "The Diver's Ear - Under Pressure" (Flash video). Retrieved 2008-05-01. ^ Vincoli, Jeffrey W (1999). Lewis' Dictionary of Occupational and Environmental Safety and Health. CRC Press. p. 325. ISBN 1-56670-399-9. ^ a b Roydhouse, N (1978). "The squeeze, the ear and prevention". South Pacific Underwater Medicine Society Journal. 8 (1). ISSN 0813-1988. OCLC 16986801. Retrieved 2008-05-01. ^ a b Taylor, D (1996). "The Valsalva Manoeuvre: A critical review". South Pacific Underwater Medicine Society Journal. 26 (1). ISSN 0813-1988. OCLC 16986801. Retrieved 2008-05-01. ^ Roydhouse, N; Taylor, D (1996). "The Valsalva Manoeuvre. (letter to editor)". South Pacific Underwater Medicine Society Journal. 26 (3). ISSN 0813-1988. OCLC 16986801. Retrieved 2008-05-01. ^ Hidir, Y; Ulus, S; Karahatay, S; Satar, B (August 2011). "A comparative study on efficiency of middle ear pressure equalization techniques in healthy volunteers". Auris Nasus Larynx. 38 (4): 450–5. doi:10.1016/j.anl.2010.11.014. PMID 21216116. ^ Roydhouse, N (1998). "Ear drum rupture in scuba divers". South Pacific Underwater Medicine Society Journal. 28 (2). ISSN 0813-1988. OCLC 16986801. Retrieved 2008-05-01. ^ Butler, FK; Thalmann, ED (June 1983). "Report of an isolated mid-frequency hearing loss following inner ear barotrauma". Undersea Biomed Res. 10 (2): 131–4. PMID 6612898. Retrieved 2008-05-01. ^ Edmonds, C; Blackwood, FA (December 1975). "Disorientation with middle ear barotrauma of descent". Undersea Biomed Res. 2 (4): 311–4. PMID 1226589. Retrieved 2008-05-01. ^ Fagan, P; McKenzie, BJ; Edmonds, C (1975). "Sinus Barotrauma In Divers". Royal Australian Navy, School of Underwater Medicine Technical Report. Project 1-75. Retrieved 2008-05-01. ^ Richardson, Drew (2006). Padi Open Water Diver Manual. Professional Association of Diving Instructors. ISBN 1-878663-16-X. ^ a b c Staff (January 2001). "Ears and Sinuses". Alert Diver. Divers Alert Network. Retrieved 9 November 2013. ^ "GYMNASTIQUE DE LA TROMPE D'EUSTACHE". apnee.ffessm.fr (in French). Fédération Française d'Études et de Sports Sous-Marins. Archived from the original on 28 November 2008. Retrieved 13 July 2014. ^ "The BTV softest method "to clear your ears"". Retrieved 29 October 2015. This page was last edited on 13 December 2018, at 14:55 (UTC).